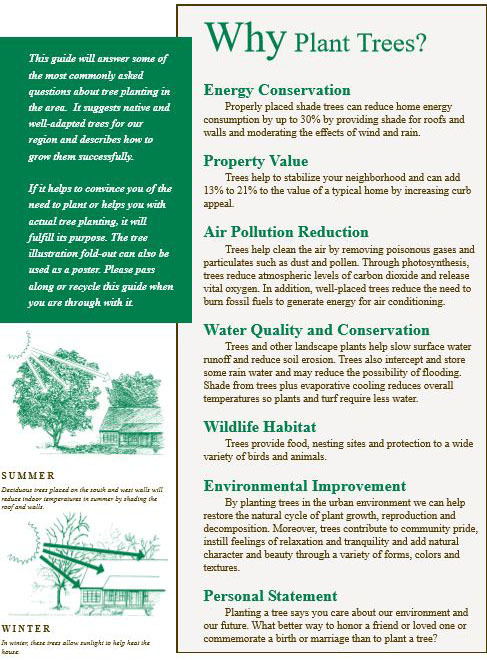 Planting a tree on or near your property can reduce flooding! Trees in our community provide many services beyond the inherent beauty they lend to streets and properties. One of the most overlooked and underappreciated is their ability to reduce the volume of water rushing through gutters and pipes following a storm. 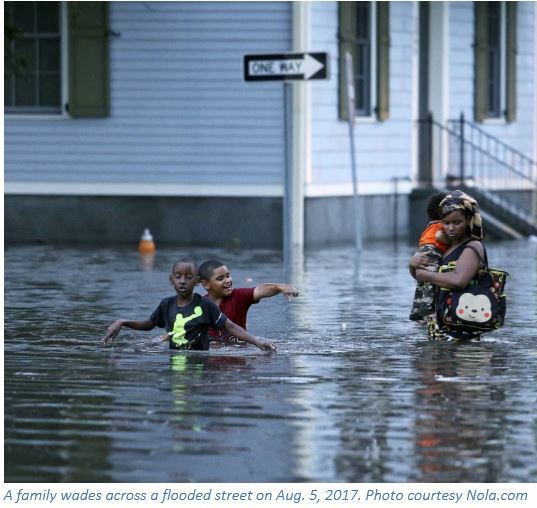 This means less investment in expensive infrastructure and – importantly – cleaner water when the runoff reaches rivers, lakes, and bayous. PLANT A TREE AND HELP REDUCE CRIME! The city of Baltimore’s high crime rate inspired a gritty TV drama. But a new study (Tinyurl.com/TreeCrimeReport) by the University of Vermont’s Transportation Research Center, in Burlington, found that a 10 percent increase in trees in a given area led to a 12 percent decrease in crime. “It’s really pretty striking how strong this relationship is,” says Austin Troy, lead author of the study, published in the journal Landscape and Urban Planning. 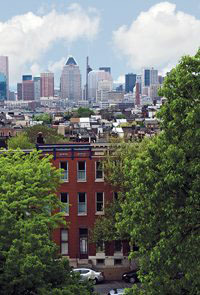 Researchers examined the correlation in and around Baltimore using aggregated crime data and combining it with high-resolution satellite images to conduct the analysis. The working hypothesis is that because people enjoy spending time in pleasant outdoor spaces, there are more observers present to hinder criminal activity. Also, a well-maintained landscape seems to send a message that someone may be watching. To avoid culture bias, the study considered many socioeconomic factors, including housing, age, income and race of residents, as well as variables such as rural versus city setting and population density. The findings should prove helpful to urban planners. Fringetrees are excellent anywhere that a very small tree is needed, such as near a patio, in small yards, or under power lines. Like many white-flowered plants, they look especially nice planted in front of a dark backdrop. They can be used as individual specimens, in groups, in mixed shrub borders or in natural gardens. They are well suited to urban plantings due to pollution tolerance and adaptability to varied soils. Fringetrees are not salt tolerant. 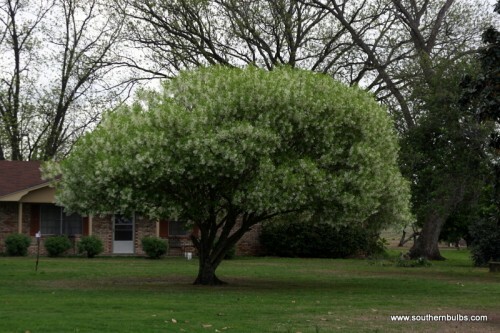 Although fringetrees are adaptable and will grow in most soil types, they prefer moist, deep, well-drained, acidic soils. They grow well in full sun to partial shade. Leaf appearance is best in some shade, but flowering is heaviest in full sun. The ideal compromise would be sun through most of the day, but shade during hot afternoon hours. Fringetrees have low maintenance needs once established. Due to a naturally strong branch structure fringetrees rarely need pruning. Pruning while young may be desirable if a single stem tree form is preferred. Fringetrees do not transplant well so take care to choose an appropriate permanent location and use proper planting methods. Plant it high, it won’t die! 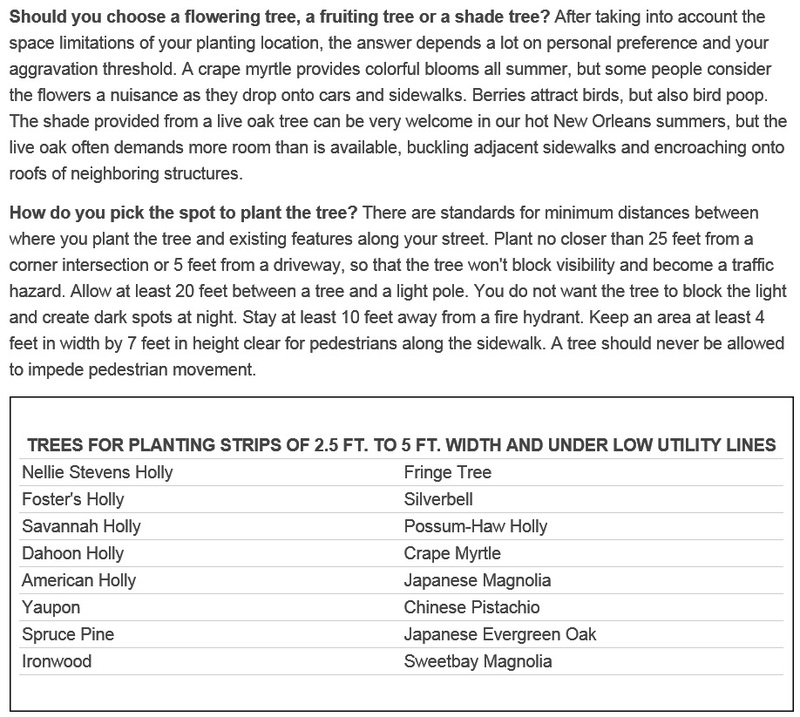 The most important consideration in planting trees and shrubs is the planting depth. Don’t plant too deep! Plant all trees and shrubs about one inch above the surface of the existing soil. No dirt should be placed on top of the existing roots and nursery soil so as to not smother the root system. Mulch well, leaving a two inch gap around the caliper(s) of the plant. 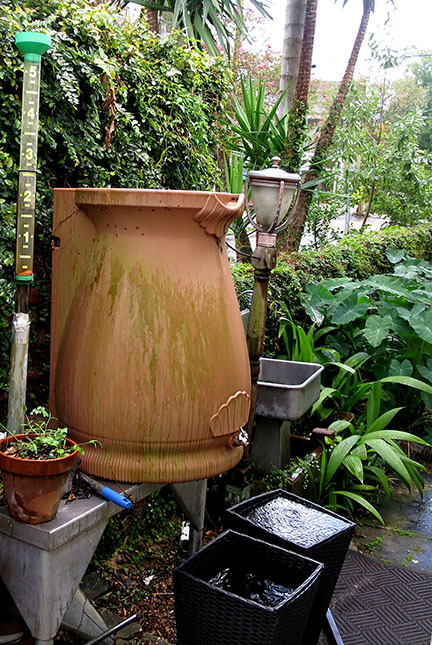 For the most efficient use of water, construct an earthen berm two to three inches high around the drip zone area of the plant after planting. Water in well after planting! Please remind your friends and neighbors to make sure their yard maintenance contractors are not blowing stuff into the storm drains. · Sec. 66-287.1. – Use of leaf blowers to transfer or direct debris to public drains prohibited. Leaf blower. A mechanical, battery-operated or gasoline-powered device which projects pressurized air forward to cause movement of leaves, grass or other debris commonly associated with grass cutting, lawn care, gardening or yard maintenance activities. Public drain. 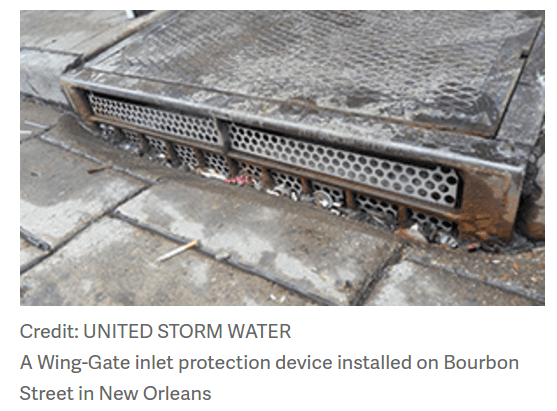 Includes catch basins or gutters located parallel to public rights-of-way, open segments of city subsurface drainage conduits, flood control and water path canals or drains located on public property and incorporated into the public infrastructure for wastewater management or scipening. Use of leaf blower to impede or restrict drainage or water flow prohibited. Use of leaf blower for private or commercial use in any manner which causes or results in the transfer, movement or directing of grass, leaves, yard debris, debris derived from yard maintenance, lawn care or any activities whereby debris is accumulated and projected to public drains or results in impeded water flow of public drains or restricts the public designated purpose of such drains is prohibited by law. Violators shall be subject to citation or administrative adjudication by duly authorized code enforcement officers or duly authorized law enforcement officers. At a time when our national and state politics are fraught with partisan discord, it’s significant to note that there are some policies that find favor on both sides of the aisle. Such a case occurred last month, when House Bill 111, which calls for the incorporation of litter education into the K-5 curriculum, received unanimous support from the House and Senate — to a round of applause. 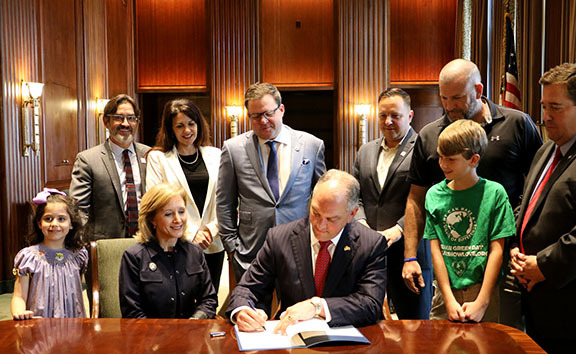 The bill was signed into law earlier this month as Louisiana Act 72, and Governor Edwards gave it his executive approval surrounded by Keep Louisiana Beautiful representatives, Representative Stuart Bishop (R-Lafayette, author of HB111), First Lady Donna Edwards and Lieutenant Governor Billy Nungesser, all of whom have been ardent supporters of anti-litter initiatives in our state. Much has been said about Louisiana’s dirty habit: we have a crippling litter problem that seems to be getting worse. Much time and resources have been spent bemoaning the problem, pointing well-intentioned fingers in different directions, all trying to find out exactly what the problem is here that you don’t see in many of our neighboring states. As in most complicated social problems, there is no magic bullet to apply to this issue and a multi-pronged approach from all aspects of our society will be required. While parents assume a huge responsibly to teach their children not to litter, we cannot put this squarely on the back of those that are oftentimes the biggest offenders. 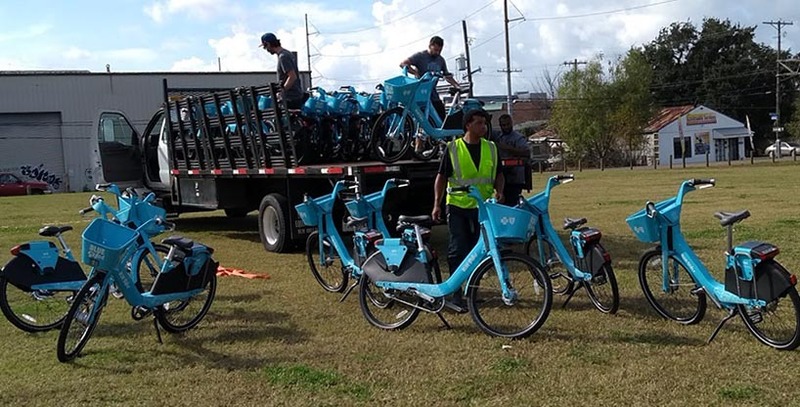 The problem will only be resolved when all of Louisiana embraces three core initiatives: improving infrastructure and policy to make it easier to reduce littering and increase recycling; increasing enforcement of the litter laws; and influencing behavior change through environmental education. 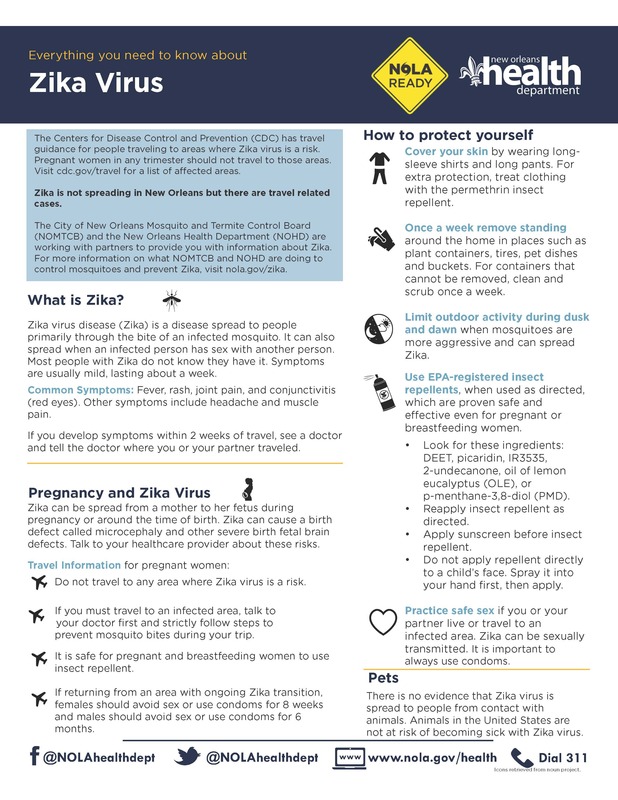 Louisiana Act 72 will go a long way to address the latter. Teaching environmental stewardship and litter education is the first step we can make towards changing our prevailing cultural attitude from one of environmental disregard to one of true stewardship. Litter education goes beyond simply not throwing trash on the ground– it includes full understanding of the impact of litter on the health of our wildlife, waterways, and economy. Most importantly, it focuses on prevention rather than spotty-at- best treatment. Keep Louisiana Beautiful, its statewide network of 40 affiliates that boast a combined force of 35,000 volunteers, and all of its many partners and supporters extend a sincere thanks to Representative Stuart Bishop and the state’s top leadership body for supporting legislature that teaches our children environmental responsibility. We hope that this measure will spark a new level of commitment and care for our state and its natural resources. 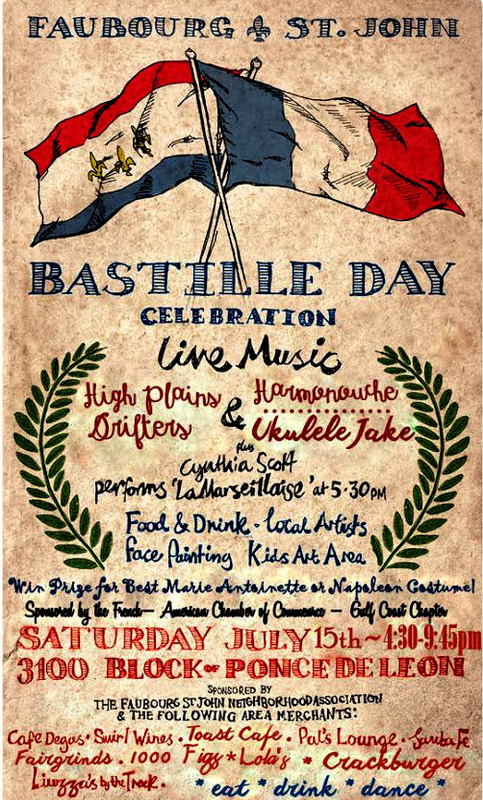 Join the fun in the 3100 block of Ponce de Leon for the Faubourg St. John Bastille Day block party in New Orleans on Saturday (July 15) from 4:30 p.m. to 9 p.m. The celebration will include food, music, children’s activities, and an art market. There will also be a contest for the best Marie Antoinette or Napoleon costume. Many people will enjoy the Faubourg St. John Bastille Day block party in the 3100 block of Ponce de Leon in New Orleans on Saturday, July 15, 2017. The celebration will include food, music, children’s activities, and an art market. On July 14, 1789 more than 8,000 men and women stormed a prison fortress in Paris known as the Bastille, demanding the release of the political prisoners being held there, plus the prison’s store of weapons. The storming of the Bastille was the spark that set off the French Revolution, an event that had a significant impact not only on France itself but its colonies and former colonies as well, including New Orleans. Arising from the tumult and chaos of the French Revolution was a young, ambitious general named Napoleon Bonaparte. In order to help finance his wars in Europe Napoleon sold off his country’s largest North American colony in what became known as the Louisiana Purchase. With that 1803 transaction, New Orleans and the rest of Louisiana – plus a vast swath of land between the Mississippi River and the Rocky Mountains – became part of the United States. 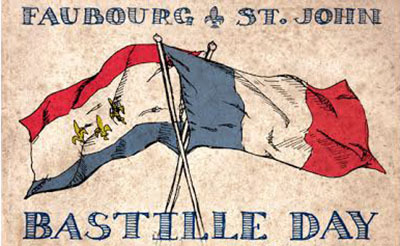 Bastille Day is commemorated in New Orleans on the closest Saturday preceding the 14th of July. The occasion is celebrated with a block party in the 3100 block of Ponce de Leon Street in the city’s historic Faubourg St. John neighborhood, adjacent to Esplanade Avenue. 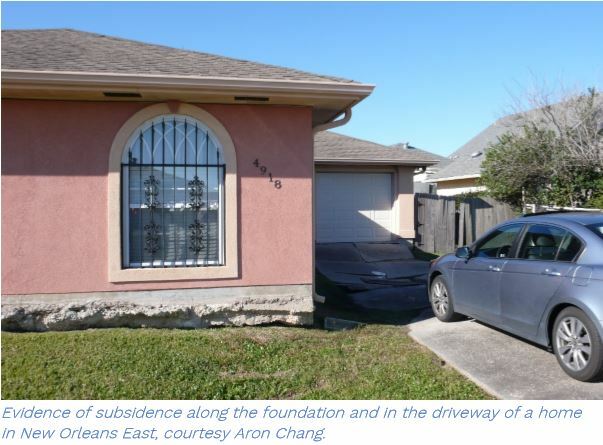 This quiet, residential section of the city was once the home of many families of French Creole aristocracy. Most of the historic houses they lived in are still visible and in use today. The Faubourg St. John Bastille Day party on Saturday, July 15, 2017 features live music, food and drinks to toast the memorable occasion. This is a family-oriented event with fun things for the kids to do, including arts and crafts and games. All of the neighborhood’s stores and businesses actively participate.